One of the most frustrating tasks you'll face at the keyboard is having to manually close a screen full of programs. Yet certain inevitable things, such as shutting down your PC, burning a CD, or starting an antimalware scan, often require all currently running programs to be closed. SmartClose (free) solves the problem neatly. Not only will it shut down your programs automatically, it will also take a snapshot of those programs so that you launch them all simultaneously, instead of having to re-open them one at a time. SmartClose will automatically close and reopen running programs. SmartClose is exceptionally easy to use. 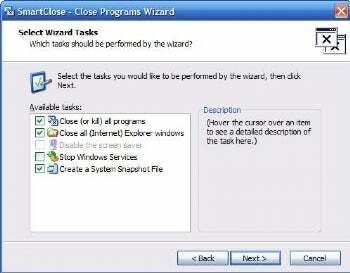 Select "Create a system snapshot and close all programs" and you'll be walked through a wizard that will close your programs, and save a system snapshot. The wizard is customizable, so that, for example, you can choose to shut down Windows services as well as applications, close Internet Explorer windows or keep them open, and so on. SmartClose then goes about its work, showing you its progress as it closes each program. SmartClose will even close programs that have hung. Some programs will still need your intervention, however--for example, if Firefox usually asks whether it should save your tabs, it will ask even when you use SmartClose. To reopen your programs, select "Restore a previously taken system snapshot," and SmartClose will re-open your programs one by on. It will only open the programs, and will not re-open the documents that were last saved in them. Note that SmartClose does have a few minor issues. When it closes Internet Explorer 7 or 8, it is not able to save a snapshot of all open tabs, and will save a snapshot of one of them. And on Windows Vista, it will not be able to save any of them if User Account Control is enabled. These are relatively minor issues, though. SmartClose is a great program for anyone who's tired of manually closing windows and then reopening them.